Since I have no crystal ball, there's no telling which will turn out to be the best dividend stocks of 2018. But I can tell you who has caught my eye. The P/E is not the be-all end-all of figuring out a stock's value, though. For example, there are some pharmaceutical companies with tiny P/E values. Sure, they're earning lots of money now, but they may have patents that are about to expire. Investors can foresee a future drop in earnings, so they sell the stock now, bringing down the price. A low P/E ratio might mean that future earnings are expected to fall for some reason or another. Dividend History: Even though a company pays a dividend now, that doesn't mean it has to keep paying dividends in the future. They may cut their dividend, or they may stop paying them out entirely. There are some stocks, called Dividend Aristocrats, that have been steadily paying dividends for many many years. 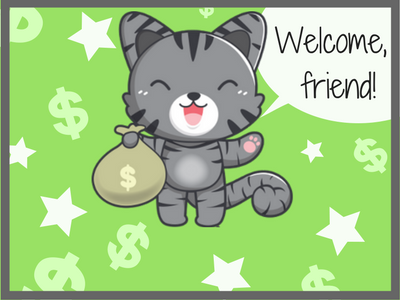 I did a little write-up on them so you can learn more about dividend aristocrats. Sector: My favorite sectors for dividend stocks are by far Food and Consumer Products. I already own lots of food producers like Calavo Growers, B&G Foods, Dean Foods, and General Mills. Everybody eats, right? I also own consumer products stocks like P&G, Church and Dwight, and Unilever. There was also a time that I was buying up healthcare REITs (real estate stocks), especially ones that were in the nursing home business like LTC Properties. I tend to stick with sectors that I know. I don't dig in to things like pharmaceuticals too much, because I haven't done enough research on them yet. Yield: Yield doesn't matter to me as much as it used to. I used to seek out stocks with high yields, but these days, I don't. It's just not tax efficient because dividends get taxed in the year that they come in to your account, as opposed to capital gains, which give you more control. So, at this stage in my plan, dividend stability is more important than yield. Even a 1% yield is fine with me as long as the company looks like it raises its dividend each year and is committed to returning value to the shareholders. Payout Date: Since my hope is to replace paychecks with dividends someday, I like to have my dividend payouts spread throughout the year. Most dividend stocks pay out four times a year, with the most popular payout schedule being December, March, June and September. This is fine since I can plan with my money, but I do enjoy getting a paycheck in the other months too. Companies are also free to change up their payout date at will, and many do. So without further ado, here are the dividend stocks I am thinking about in 2018. 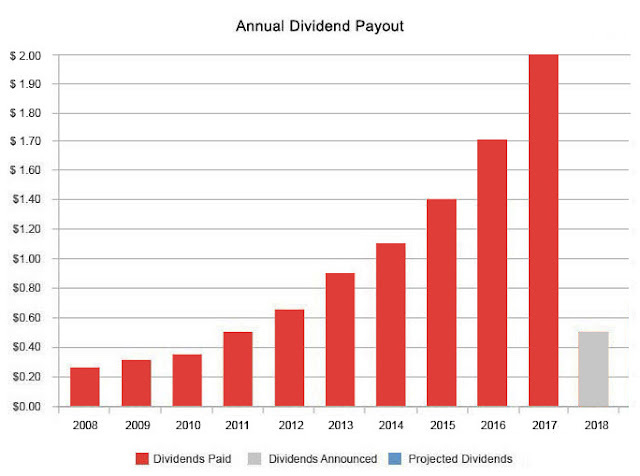 With more than 30 consecutive dividend raises, AT&T is a dividend aristocrat. The price to earnings ratio is 18.29, which isn't bad compared to all stocks but much higher than their competitor Verizon, which is 13.53. Consumer products stocks are like pokemon to me. I've got to catch 'em all. You know Colgate Palmolive for their dish soap and toothpaste, but their brands also include Soft Soap, Speed Stick, Murphy's Oil Soap, and Tom's of Maine! I have this fantasy where you won't be able to buy toothpaste without picking a brand that I own stock in. Price-wise, Colgate Palmolive had a long year of gains, and the P/E ratio is almost 30- that's high! The dividend yield is at 2.11%, and their dividend history is solid, with yearly increases for 54 years! Investors are freaked out at CVS's $69 Billion acquisition of Aetna. The stock price took a tumble recently on the news, but it has yet to be seen whether it will turn out to be a good move by CVS or not. Generally, I am a fan of vertical integration because it allows more efficiency, but all this debt might be too crazy! CVS has a price to earnings ratio of 15.67, compared to competitor Walgreens' 19.19. The yield is 2.63%. As far as dividend history goes, they're pretty solid, as you can see by the above chart. More than just Kraft Macaroni and Cheese or Heinz Ketchup, the Kraft Heinz company also owns valuable brands like Kool-Aid, Jello, Grey Poupon, Maxwell House, Cracker Barrel cheese, and Gevalia. Their P/E ratio sits a little high at 24.35, compared to competitor Campbell Soup Company at 16.48 and Mondelez at 29.68. As for dividend history, the Kraft Heinz Co. is fairly new in its current form, resulting from a merger between - you guessed it- Kraft (A spinoff of Mondelez) and Heinz. Heinz was once a dividend aristocrat, until it cut it's dividend in 2003, then got back on the dividend wagon in 2004. Mondelez wasn't so excellent about its dividend, especially in the aftermath of the financial crisis. Kraft-Heinz Co. has a yield of 3.2%. What 2018 Dividend Stocks do you have your eye on? Let me know in the comments! I like CL and KHC from your picks. Of course, I'm always partial to the consumer staples space. If the market remains hot, I think we might even witness a buyout of CL or CLX for that matter. Those two names look like they can be absorbed into a larger consumer conglomerate.